On the road again, here’s Iowa somewhere between Iowa City and Des Moines. 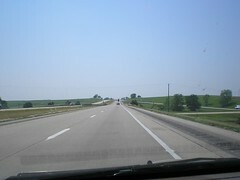 I’d like to say Iowa is more exciting than this, but that might be an exaggeration. I took a walk around the Cedar Falls neighborhood this morning, and I noticed a crew starting to strip off the shingles on the roof. The thing that struck me was they were wearing old-fashioned jeans and shirts, and they all had those Abe Lincoln beards. And they were all white, which is more common in Iowa, I suppose. Amish? I wondered…. They might also be Dunkards, aka German Baptists or Church of the Brethren. We saw them quite a bit in Indiana. They frequently do carpentry as part of their orthodox beliefs, I understand, to continue the work of Jesus (literally). He needs to record the hymns and then do a pod-cast! There are sizeable Amish communities around here (Western IL and Iowa). I often see Amish at the coffee shops in town, and I run past a few Amish farms. Next PostNext How’s Annette’s leg, anyway?